Wawawewe began when our car was swapped for a piece of land in Lipah Village, one of the first few businesses to be established in the Amed area in 1996. At this time the roads were rough and impassable in places, with no bridge over the river. Family and friends came together and helped clear the land, keeping as many palms as possible. With respect for the land, one palm in particular needed a special Hindu ceremony to ensure that a new home was found for the good spirit living within it. We were able to create a traditional, rustic bar, restaurant, and four bungalows. A successful approach that has enabled us to expand and add to the Wawawewe family! The Wawawewe team are our family. Everyone is committed to providing all our guests with the most memorable Balinese experience during their time with us. We also want our staff to learn, progress and develop in their life and we support and help them to understand who they are and find their own strength. Wawawewe is a family business which was created from very little, but has grown, providing a Balinese experience for our guests. We have employed and trained our family, who have supported our journey. Our staff also have developed their own small businesses, renting snorkels and motor bikes, sewing and Balinese dance lessons, we even have an Artist who exhibits his work at home and in The Amed Art Gallery. They are happy to take you on tours and welcome you into their homes for Hindu Ceremonies and help you enrich and enjoy your stay with us. 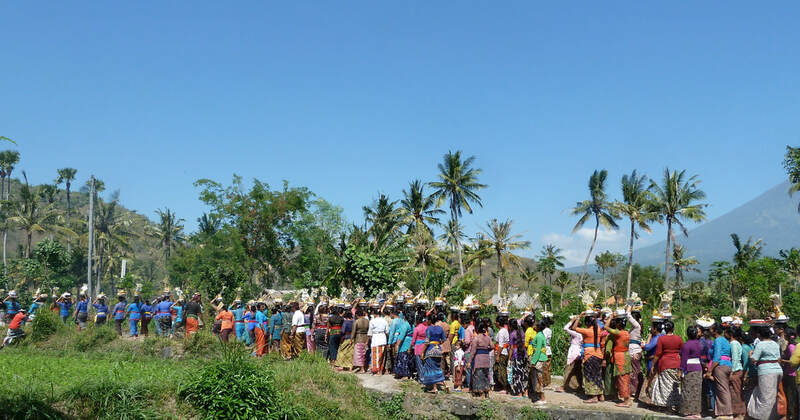 This provides local people with employment while supporting Balinese culture. Peduli Alam -As part of our commitment to helping the local community, we are one of the main sponsors for Peduli Alam (meaning "protect Nature" in Balinese), an inspirational and innovative NGO educating villagers about waste. In particular, the impact on nature and health that results from incineration or disposal of garbage in nature, rivers and sea . They aim to provide simple solutions with easy access, as well as encourage recycling by creating usable art from discarded packaging. At Wawawewe I in Lipha village we have provided a workshop and office space for Peduli Alam, where stunning products from recycled plastic are sold in the shop and the local children gather to learn about the importance of recycling and learn to craft products which can be sold. Mount Agung - During the recent crisis of The Mount Agung activity which started in September 2017, the Amed community truly came together to aid the evacuees who live in the danger zones, as well as locals directly affected. Much was needed - volunteers, Balinese, expats and visitors all stepped forward to help in many ways. Team Action Amed was born out of the crisis, donating food, bedding, toiletries, health care, water filters, cleaning and other items needed to make the evacuees as comfortable as possible in temporary shelters in Amed. We opened our home in Biaslantang, Amed as an office, store and distribution centre for all the hard ware donations. Team Action Amed continues today. Even though the evacuees have been able to all go home, many locals are still in need of support. The Amed community has become a strong family throughout the crisis, everyone has been affected, but we are glad to say that Mount Agung has settled down and life is returning to normal. Simply, our aim is to provide a truly memorable Balinese experience at an affordable price for all.